Welcome the new leader of the 2014-2015 Denon AVR range. Featuring ultimate build quality with a left/right-separated monolithic amplifier design and custom made DHCT (Denon High Current Transistors), the AVR-X7200WA guarantees best-in-class sound quality with minimum interferences. Thanks to built-in Wi-Fi and Bluetooth, it is perfectly set for all network services including Spotify Connect, AirPlay, Network Music Streaming and Internet Radio. Via its 8 HDMI full HDCP 2.2 compatible inputs (including one on the front panel) it handles 4k 60Hz pass through playfully, and even upscales video to 1080p and 4k 60Hz. Now add brand new Dolby Atmos, triple HDMI outputs with multisource/multizone functionality and integrated Audyssey MultEQ XT32/Sub EQ HT/ LFC to guarantee the ideal calibration of your setup. The unique Denon Link HD function, guaranteeing the ultimate in entertainment pleasure, works in combination with AL32 Processing Multichannel and DDSC-HD32 for higher resolution audio playback. All sums up to the most comprehensive AVR experience we are pleased to offer. Stream your favorite tracks wirelessly to the AVR-X7200WA directly from your Bluetooth-enabled portable devices, such as a smartphone, portable media player, and tablet. The AVR-X7200WA can recognize and remember up to 8 Bluetooth portable devices, so your family and friends can enjoy their favorite tracks. With the built-in Wi-Fi feature, you can connect the AVR-X7200WA to your home network wirelessly and open up a whole new world of content streaming functions, including thousands of internet radio stations as well as the ability to stream subscription service Spotify Connect, Pandora, and SiriusXM. With AirPlay, you can wirelessly stream your favorite audio tracks directly from your iOS device, including the iPod, iPod touch and iPad. DLNA 1.5 certification lets you enjoy streaming content via your PC, Mac or Android device. 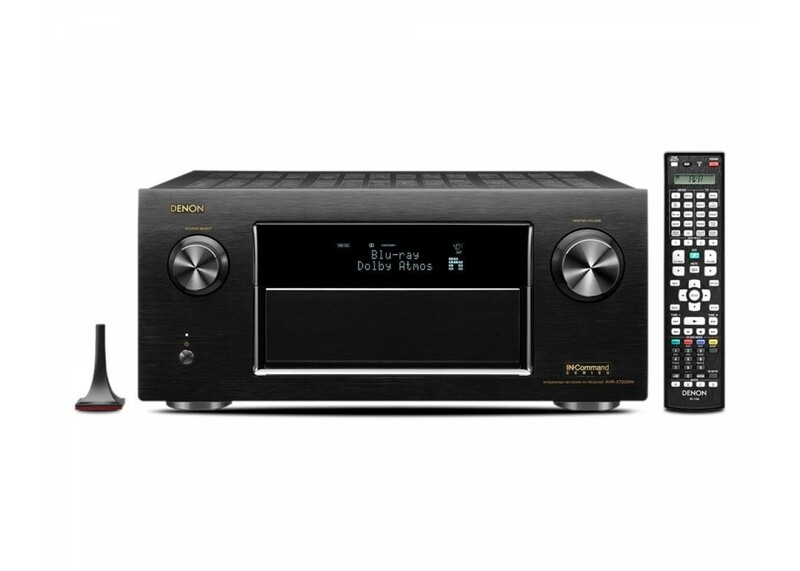 Via our Denon Remote App, you can wirelessly control the AVR-X7200WA from your favorite portable device. The Denon Remote App is available in iOS and Android versions, and is also available for the Kindle Fire. Eight systems are provided for the 4K video signal supporting HDMI input. One of these systems is located at the front so that you can easily enjoy video from a movie camcorder, game console, or smart phone. The HDMI output has a new terminal for zone output in addition to 2 systems capable of simultaneous output to allow the HDMI input video and audio to be output to a sub-zone. With each channel rated at a maximum power of 260 watts, the AVR-X7200WA features a left/right-separated monolithic power amplifier design with Denon custom made transistors and identical circuit topology on all 9 channels. Our new Eco Mode provides the ability to reduce overall power consumption and features an on-screen Eco Meter that lets you see the power consumption reduction effect. The Auto Eco mode automatically switches between normal and Eco modes, depending on the volume level chosen, and the power amplifier block is rated to drive low impedance speaker loads, down to 4 ohms, for compatibility and stability with virtually any loudspeaker model. It is the most accurate room correction solution with more than ten thousand individual control points allowing finer details of the room’s problems to be captured and corrected. The ultra high resolution filters are applied to all channels including the two independent subwoofers, with the most obvious benefit being heard in the low frequency range where correction is needed the most. Audyssey LFC uses psychoacoustic algorithms to prevent bass from passing through your walls and disturbing your neighbors while maintaining the bass performance in the listening room. The AVR-X7200WA is also Audyssey Pro ready for the most advanced professional room correction. With Dolby Atmos, sound comes alive from all directions, including overhead, to fill the home theater with astonishing clarity, power, detail, and depth. The AVR-X7200WA has the processing power to run a more enveloping, Audyssey MultEQ XT32 calibrated 7, 9 or 11 channel Dolby Atmos layout using 5.1.2, 5.1.4, 7.1.2, 7.1.4* or 9.1.2* configurations utilizing ceiling mounted, or Dolby Atmos-enabled speakers. A 5.1.2 or 5.1.4 speaker configuration is based upon a traditional 5.1 speaker layout complemented by 2 or 4 overhead or Dolby Atmos-enabled speakers. A 7.1.2 or 7.1.4 configuration is based on a 7.1 speaker layout with 4 overhead, or Dolby Atmos-enabled speakers. A 9.1.2 configuration is based on a 9.1 speaker layout with 2 overhead speakers. The AVR-X7200WA lets you enjoy a program source in the Main Zone (the room where the AVR-X7200WA is located) and in Zone 2 and Zone 3. The source can be the same for all zones, or you can enjoy different sources in those zones if you prefer. The sources for the zones can be either analog or 2 channel digital PCM sources (incl. optical, coaxial, HDMI and network). Support 4K video to enjoy 4 times higher resolution videos than current HD on larger displays and screens. Dimensions (W x H x D): 17.10 x 7.72 x 16.81 in.